Township officials say the newsletter will help improve communication with residents and remind them of events and activities in town. Mt. Laurel residents should have found something new in their mailboxes in recent weeks when the township mailed its first Township of Mt. Laurel Newsletter. The newsletter, which the township is planning to mail to all residents throughout the year on a quarterly basis, is part of an ongoing effort to improve communication with residents and provide information about recent township activities and upcoming events. The inaugural Winter 2018 edition opens with a section introducing this year’s mayor and council, before outlining information the township believes residents should know from now until the start of spring. The Winter 2018 newsletter reminds residents of events such as the Taste of Mount Laurel on March 22, the township’s free rabies clinic for pets on March 24 and the annual Clean Up Day and confidential document shredding event, each scheduled for April 28. The newsletter also outlines recent business activity in town, such as a holistic lifestyle spa that opened in the fall, and upcoming openings for new business such as the Topgolf entertainment venue, a Burlington department store, a new Royal Farms convenience store and a new Hampton by Hilton hotel. Also included is a list of all roads the township plans to pave for 2018, as well as a list of addresses and phone numbers for municipal contacts residents may need to utilize on a day-to-day basis, such as the clerk’s office, public works, tax collector’s office and information for police, fire and EMS services. The newsletter also features a message from the Mt. 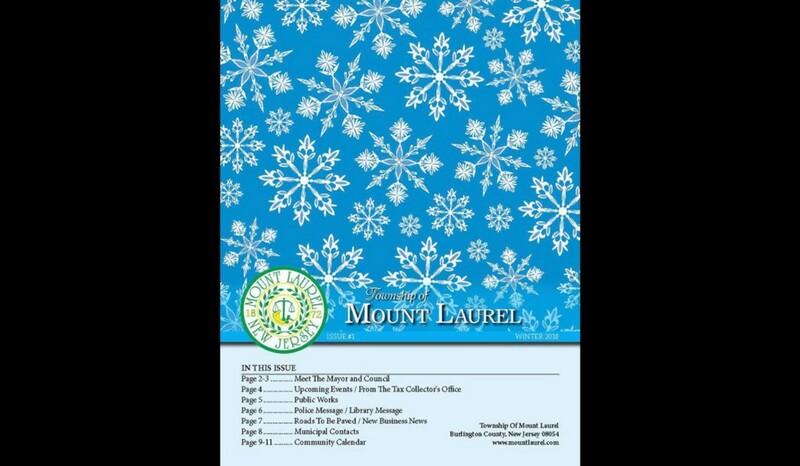 Laurel Tax Collector’s Office about upcoming tax collection dates and a message from the Department of Public Works about snow removal and procedures for disposing of bulk items. The Mt. Laurel Township Police Department also included safety tips, and the Mt. Laurel Library included an overview of all the services residents can access with a library card. Also included in the newsletter is a calendar to help residents plan for February and March with dates of township meetings, days for recycling pickup, seasonal township events and specific days where township offices will be closed. “The calendar only includes a few months, so residents can easily hang it on a wall to be reminded,” Tomczyk said. In addition to mailing the newsletter to all residents, the township has also posted the newsletter in its entirety on the township’s newly created Facebook page @TownshipofMountLaurel.